Milburn G. "Mel" Apt (April 9, 1924 – September 27, 1956) was a US test pilot, and the first man to attain speeds faster than Mach 3. He was killed in the destruction of the Bell X-2 during the record-setting flight that exceeded Mach 3. Apt was born April 9, 1924, in Buffalo, Wilson County, Kansas, to parents Oley Glen Apt (1891–1975) and Ada Willoughby Apt (1896–1987). He graduated from Buffalo High School in 1942. He joined the U.S. Army Air Forces immediately, was sent to flight school, and was commissioned in February 1944. He served with the Caribbean Defense Command until June 1946. In 1951 he received a Bachelor of Science degree from the University of Kansas as well as a bachelor's degree in Aeronautical Engineering from the U.S. Air Force Institute of Technology. He graduated from the Experimental Flight Test Pilot School at Edwards Air Force Base (Class 54B) in September 1954. After having been launched from a B-50 bomber over the Mojave Desert in California, Apt, flying an X-2 rocket-powered plane on its 13th powered flight, set a record speed of 3,377 km/h, or Mach 3.196 at 19,977 m (65,541 ft). Subsequent loss of control from inertia coupling led to the breakup of the aircraft and Apt's death. The X-2, initially an Air Force program, was scheduled to be transferred to the civilian National Advisory Committee for Aeronautics (NACA) for scientific research. The Air Force delayed turning the aircraft over to the NACA in the hope of attaining Mach 3. 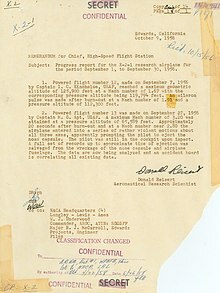 The service requested and received a two-month extension to qualify another Air Force test pilot, Apt, in the X-2, and attempt to exceed Mach 3. In the run-up to his first rocket-plane flight, Apt had several ground briefings in the simulator. His simulator training had indicated control difficulties in high-speed flight, and possible techniques for handling them. On September 27, 1956, Apt made his first X-2 flight. He raced away from the B-50 under full power, quickly outdistancing the F-100 chase planes. At high altitude, he nosed over, accelerating rapidly. At 65,000 feet, the X-2 reached Mach 3.2 (2,094 mph), making Apt the first man to fly more than three times the speed of sound. Upon rocket burnout, Apt found himself further from home than anticipated. The planned flight profile called for slowing to Mach 2.4 before turning back to base. The additional time to slow before turning may have put him beyond safe gliding range of his planned runway. Still above Mach 3, he turned back to Edwards. The X-2 began a series of diverging rolls and tumbled out of control. Apt tried to regain control of the aircraft. Unable to do so, he separated the escape capsule. The capsule's drogue parachute opened, but not its larger parachute. Too late, Apt attempted to bail out and was killed when the capsule hit the Edwards bombing range. [dead link] The rest of the X-2 crashed five miles away. Prospective X-15 pilots were subsequently shown the on-board film of Apt's fatal crash, taken by a stop-frame camera mounted behind Apt in the cockpit. Apt was survived by his wife and two daughters. One of Apt's daughters, Sharman Apt Russell, who was two years old when her father died, grew up to become a writer. ^ "Bio: Milburn G. Apt (Captain, USAF)". Findagrave.com. Retrieved 2017-04-01. ^ Merlin, Peter W. (October 5, 2011). "Starbuster: 55 years ago Capt. Mel Apt conquered Mach 3, lost life on fated flight". Archived from the original on March 4, 2016. ^ Blair, Clay, Jr. (March 1957). "The Last Flight of the X-2". Air Force Magazine. 40 (3). Retrieved November 13, 2012. ^ Friedlander, Mark P., Jr.; Gurney, Gene (1973). Higher, Faster, and Farther. New York: William Morrow & Company. pp. 63–65. ISBN 0-688-00204-8. ^ Wolfe, Tom (1979). The Right Stuff. New York: Farrar, Straus and Giroux. pp. 202–203. ISBN 0-374-25032-4. LCCN 79-13901. ^ Russell, Sharman Apt (Winter–Spring 2009). "Letter to My Father Concerning the State of the World". Terrain.org (23). ISSN 1932-9474. Retrieved October 3, 2013. Essay by Apt's daughter, Sharman Apt Russell. This page was last edited on 1 January 2019, at 20:52 (UTC).